Melanie Martinez, born April 28, 1995, is an American singer and songwriter who rose to prominence in 2012 after appearing on the American television vocal talent show The Voice. She auditioned singing Britney Spears’s “Toxic”, and finished in the top 6. 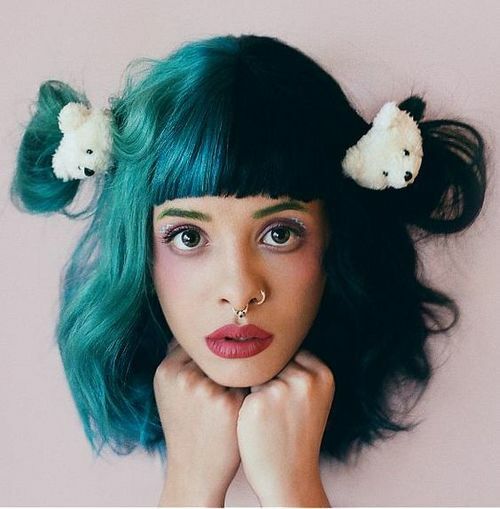 In 2015, she released her conceptual debut album titled Cry Baby. Melanie was born Melanie Adele Martinez in Astoria, Queens to parents of Dominican and Puerto Rican decent. She was previously in a relationship with Miles Nasta, Vinnie DiCarlo, Jared Dylan, and Edwin Zabala. She is in a relationship with producer Michael Keenan. She attended Plaza Elementary School in Baldwin, New York. She also attended Baldwin High School. *She was born in Astoria, Queens and raised in Baldwin, New York on Long Island. *She is of Puerto Rican and Dominican descent. *Her fans are unofficially called “Crybabies”. *She collects stuffed animals and toys from the ’50s and ’60s. *Her grandmother inspired her to be a singer. *She has 36 tattoos displayed on her body, most of them are a reflection of her childhood interests. *At age 14, she learned how to play guitar by herself. *She is famous for her two-toned hair. *Follow Melanie on Twitter, Facebook, YouTube, Tumblr, and Instagram.